You are here: Home / Galaxy Note 4 How-To Guides / How to silence Galaxy Note 4? More and more people are aware of mobile etiquette. In some locations, you should silence your Galaxy Note 4. This guide show you how to silence Galaxy Note 4: enter silent mode, enter vibration mode, stop touch sounds of keyboard, and stop reading of incoming messages and notifications. How to enter Galaxy Note 4 silent mode and vibration mode? Like many other phones, Galaxy Note 4 has 3 sound modes: sound, vibration and silent. Please note these 3 sound modes are for ringtones and notifications only. The media player and alarm have their own sound settings. There are 4 quick ways to quickly change the phone mode to silence Galaxy Note 4 or exit silent mode. You can access the notification panel by swiping down from the status bar (top of the screen) with one finger as shown below. Once notification page is open, you can tap speaker icon (Sound, see below). 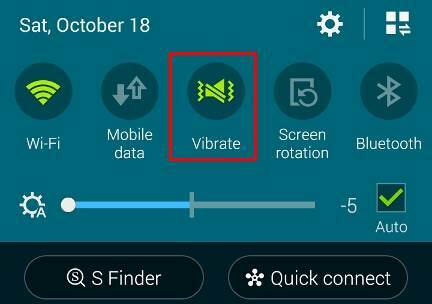 The icon will change to vibration and the phone enters vibration mode as shown below. 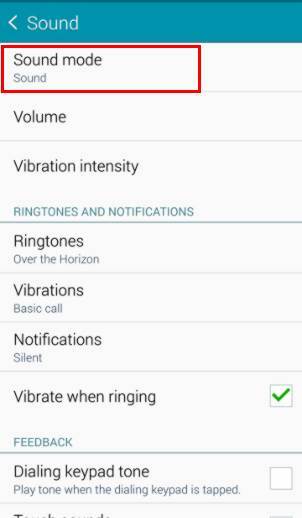 In vibration mode, the Galaxy Note 4 ringer and notification tones will not be played. But if you set vibration notification, the phone will vibrate once the notification comes. In vibration mode, tap the speaker icon again, Galaxy Note 4 will enter silent mode or mute mode (see screenshot below). In silent mode (mute mode), ringer and notification will be muted and vibration will not be activated as well. When you tap this icon again, it will enter normal sound mode again. So, this button cycles through sound mode — vibration mode –mute mode. Update: this method works on Galaxy Note 4 with Android KitKat 4.4. If you have updated your Galaxy Note 4 to Android Lollipop, the sound mode option was removed from power options. You have to use other methods mentioned in this guide. You can also press and hold the power button (for about 2-3 seconds) to get the power button options on the screen. In the device options shown on screen, you can choose sound mode, vibrate mode and silent mode (mute mode) as shown below. Just tap the sound mode you want to enter. Tap anywhere outside this popup window to close the device options window. The third quick way to silence Galaxy Note 4 is to keep pressing the volume down button. Once the volume level reaches 0, Galaxy Note 4 will enter vibration mode if you press the volume down button more. To exit vibration mode, tap the volume up button. When you press volume up or volume down buttons, the screen will display the sound level. This method will not work if you are watching videos or listening music. Because when the speaker is currently used by media playing apps, the volume button is binding to the volume for the media player. 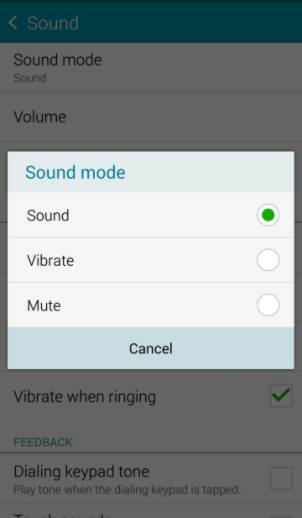 The fourth method to silence Galaxy Note 4 is accessing Settings–Sound — Sound mode as shown below. After tap sound mode, you are given the 3 options for the 3 sound modes. 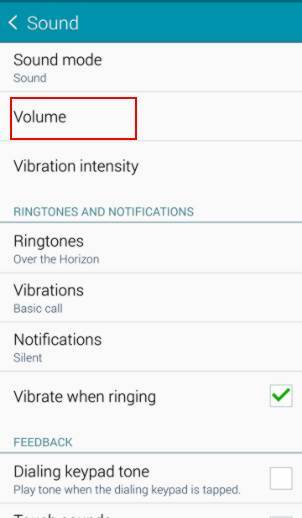 How to adjust the volume of Galaxy Note 4 ringtone and notifications? Sometimes, you may want to adjust the ringer volume, instead of silencing Galaxy Note 4. 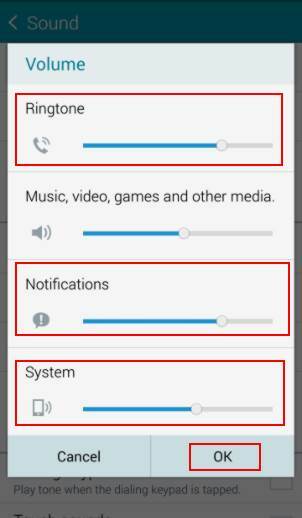 You can access the Galaxy Note 4 volume settings through Settings–sound –volume as shown below. You may noticed that ringtone, notifications, media, ans system all have individual volume level settings. How to stop Galaxy Note 4 keyboard touch sound, screen touch sound and dialing pad tone? 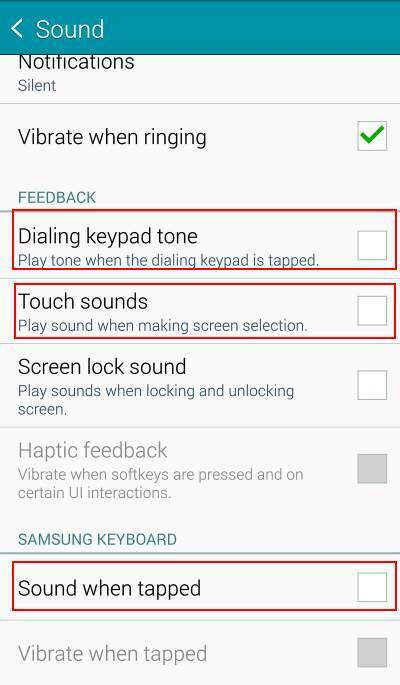 In Galaxy Note 4, you can silence the keyboard touch sound, screen touch sound and dialing pad tone in one location. Go to Settings –Sound, scroll down to find these options. 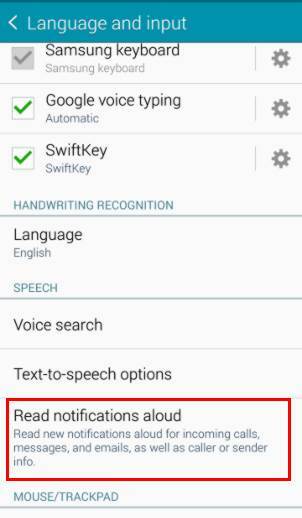 To silence Samsung keyboard, uncheck Sound when tapped under Samsung keyboard category. Dialing keypad tone, screen touch sounds and screen lock sound are under Feedback category. How to stop Galaxy Note 4 reading incoming messages and notifications? Sometimes, you may notice Galaxy Note 4 reading all incoming messages, notifications and callers name. Now you want to stop such reading. But you forget where to turn them on/off. In Galaxy Note 4, there are several different settings that can lead to reading messages, reading notifications, reading emails, reading calendar events, and announcing incoming calls. Here is the check list if you want to disable (or enable) audio output for messages, notifications and calls. If TalkBack is enabled, Galaxy Note 4 will provide spoken feedback to help blind and low-vision users. It will not only read messages, notifications and announce incoming calls, but also describe what you touch, select and activate. Galaxy Note 4 car mode allows you to control Galaxy Note 4 using voice commands, instead of hands. Or course, all incoming messages and notifications will be read. The incoming calls will be announced. To access card mode, you can swipe down from the status bar with 2 fingers as shown below. In quick settings panel, you can tap car mode to activate it (green). Tap it again to deactivate the car mode as shown below. Another setting that also triggers reading the messages and notifications is under Settings–Language and input–Read notifications aloud. You can actually fine tune this feature to let Galaxy Note 4 read calls, messages and emails from certain contacts (priority contacts). It can also announce the calendar event info and alarm info if enabled. Of course, if you want to silence Galaxy Note 4, you can uncheck them so that Galaxy Note 4 will not read such messages and notifications. Can you silence Galaxy Note 4 now? If you have any problems or questions to silence Galaxy Note 4, please post them in the comment box below. How can you change the default sound of screen touch on Samsung Galaxy Note 4 without having root access to your phone or just turning it off? My husband wants a siund but the drip sounds makes me insane! Is there a way to select a different sound somewhere that we just have not located? You can turn off the touch sound in settings. It’s hard to change the sound because the sound file is located in the folder in which your cannot write or change files. So is there REALLY no way to quickly silence a text ringtone that is incoming? On my Galaxy S6 edge , all I had to do was push the volume key or the power key, or open the message app, (either the default message app or messages+ app. ) On my Note 5, I can’t find a way to quickly silence. Like if you are in a meeting and forgot to turn your volume down. THIS IS CRAZY if there is no way to silence quickly, with the push of a button. 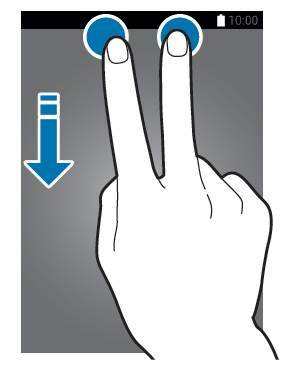 The gesture thing doesn’t work in this case either… (turning over) I have seen this asked before, but no answer. Please someone answer! Thx! For text message notifications, you should not use long music. Volume down button should work, but it take time for the phone to response. Anyway, you should use short sound as notification tone. If you are in a working environment, it can be annoying to play long music just for notifications. Most Galaxy phones have led to let you know whether there are any new notifications. does anyone know how to make it stop making noise when you sign on to facebook? In Facebook app? you can tweak notifications inside the Facebook app to silence some or all notifications. How do I silence my notifications while still having my ringer on loud (By silence, i mean NO vibration or noise). When I go to bed I lower the Media and notification bars all the way down (so that my phone doesn’t go crazy with social media notifications or texts messages) but I like my ringer to be loud incase there is an emergency. However, when I lower the bars (using the bottons on the left side of the phone) my phone still vibrates LOUDLY when I receive any notifications. Is there an easy fix to this instead of changing the settings on my phone or on my social media pages? You can use do not disturb under settings – sound and notifications to get what you want. 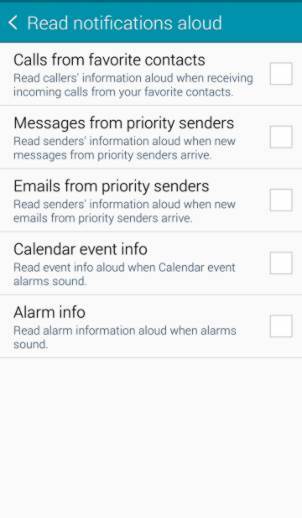 I have the Galaxy s4 and have had the issue that some calendar reminders are ringing while DND is on – in my settings, I do not have events and reminders selected as exceptions to DND – only alarms and phone calls from specified contacts. This is driving me crazy. Did you notice the types of events? 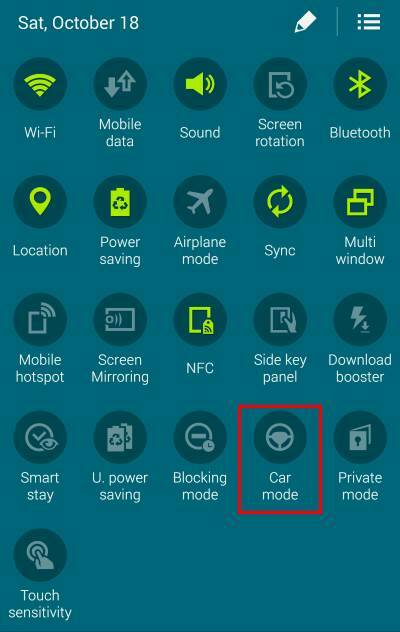 You can install car mode from Galaxy apps. In some regions, car mode was not pre-installed. This is somewhat related to this issue, as it relevant to ringer volume: when I remove a ringing phone from my belt-clip, the ringer volume attenuates. is there a way to not deviate from the selected ringer volume? Not sure. If it is ascending ringtone (which is available in some regions), you cannot disable it. What sound do you want to silence? I have a Samsung Note 4 and every time while i’m conversing with another cell phone party we both hear this annoying keypad tone as if someone was holding down or pressing on the keypad. I’ve tried everything I could think of from going to silent mode to resetting my phone and physically changing it to another unit, but to date this annoying keypad tone persist. My carrier tech support as well as Samsung tech support can not tell me why this still persist. All I get is more questions and no answers. I think it’s time to change to another model or phone. You will hear it once in one call, or every a few mins? I get this noise on my calls as well. How can this be stopped? It’s hard to say. Noise cancelling for your mic is always on and there is no option to disable or enable it. How do you silence a text notification alert while it’s coming in? The gestures, power button and volume methods only work for incoming call sounds but not notifications from emails, texts etc. I do not want to silence these alerts before hand but be able to quickly silence them once they start. Every phone I’ve owned prior allowed this through a quick button press but not the Note 4 with 5.0.1 on T-Mobile.Thanks for your time. Not a solution. But you can use short notification tone together with notification reminder. Thanks but unfortunately I need it long for those times I don’t have my phone on me. Seems like a simple thing but I don’t hear many people asking about this so there must not be a huge demand for this function. Thanks again for your quick response. I *want* my note 4 to read my preferred contacts name out loud when they text me, however, I can’t find a way to control the volume of the announcement. It seems to only announce it at full volume. Any idea how to adjust that volume? I’ve tried playing around with the different volume settings to no avail. As I know, it uses “normal” volume level and you cannot control it except silencing the phone. I figured it out. The noise was from one of my application (games) on my phone. I have an issue I have yet to see in this comment thread. I have a Note 4 on Sprint running Lollipop, and the left-side volume key will completely mute the phone ringer if I accidentally hit it in the exact center between volume up and volume down. The only way to get it to rind again is to hit that button again in the exact right spot. No amount of hitting the sound setting in the quick drop-down menu or in the full settings menu, or simply increasing the volume with the side key will turn the muting off. As you might imagine, I have no idea when this has happened since there is no indication the ringer is muted, and I miss countless calls. Any hints? After pressing the location, what’s the volume settings? The volume setting doesn’t appear to have changed at all when this happens, which is why it took me so long to figure out how I had muted my phone when it otherwise should have been ringing. If I use the sidekey to raise the volume, it appears as if I was already at a fairly high volume; same if I use the settings menu. Nothing indicates the phone is on mute when this happens. The sidekey has to be depressed exactly in the center to have this happen, and since the power key is positioned where it is, I can easily mute the phone via this action just by the way I hold the phone to use the power key. It’s really frustrating because I don’t know that I’ve done it until I start getting voicemail notifications but I’ve had my phone in my hand or in front of me on my desk and it never rang. Did you feedback this to Samsung? Or visit Samsung service center? I don’t think this is a “feature” of the phone. Very likely is a bug. Of course, you can try to backup your data and reset the phone. I live chatted with Samsung, and they suggested I power off the phone, remove the battery and wait a minute, replace and power up. That seems to have solved the problem. Fingers crossed. If you have updated to Lollipop, you can set the phone as DO NOT Disturb in settings — Sounds and notifications. If your Note 4 is till on KitKat, you can use block mode, which has similar features. My Note 4 used to have the sound option buttons you describe when I pressed and held the power button – I used it all the time in meetings because it was quick. Since it updated itself to Lollipop these icons have disappeared, and I have to open my lock screen, drag down the notification bar and cycle through the sound options. Is there a way to add the icons back to the power button? Unfortunately, this option was removed in Lollipop. Another feature I got use to was in the lock screen my next alarm time was on there without going back into my Note 4 To double check. When they do upgrades it should make our lives easier. It’s there but it’s hidden. Press power button, then use volume toggle to bring up the volume menu. Not sure what exactly you want to do. If you want to silence notifications when you are on a call, you can disable Notify during calls in Settings-Application settings–Call–Call alerts–Notify during calls. How can I Get rid of sound interruptions and easily turn down my sounds settings when I press the sound button in my note 3? 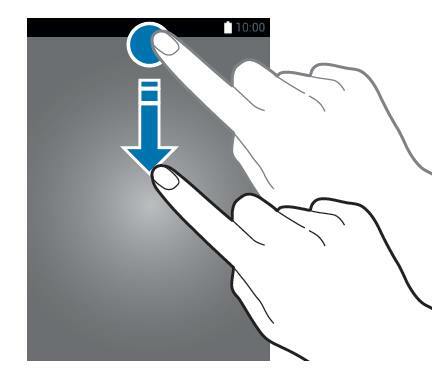 Turn over the phone so that the screen is facing downwards. But you need enable it (by default it is enabled) in Settings–Controls–Motions–Mute/pause. Is there a way to fix the increasing ringer on the Note 4? I want the ringer to be the same volume start to finish. Did you read the part of “How to stop Galaxy Note 4 reading incoming messages and notifications?” in this page? Thank you for your response happen to be an app that was causing the trouble…. It’s called who’s calling my nephew who sometimes play with the phone installed the app I just removed the app and everything went back to normal thanks again! How do I silence incoming emails but NOT silence incoming texts? Each email account has its own notification settings. So, you can easily silent the email notifications. In Settings–Application settings–Email –Manage accounts, tap the email account, under notifications, you can turn off sound and vibrate. (you can also access this from Email app). Wish it had a silencing button on the side – like the iPhones – just a click really. I have a four digit security code which I have to activate if I am to swipe down the screen. Takes time. In my case, the best option seems to be the volume button. Samsung should seriously think of an iPhone like silencing button. I have the Note 4 and since the upgrade a few days ago my text messages come through with one long vibration sound.. how do I switch it back to my text coming with the two quick vibrations only and my calls as one long vibration? I don’t think you can different vibration patterns for calls and messages. I don’t know…I have a galaxy note 3 (thought I had 4) I get no warning. I just use app that came on phone. When someone sends me a text, they can always see when I read the text because the date and time when I read it shows up on their phone. How can I block this on the galaxy? It’s simple on the iPhone. ..yyou can just turn it on/off. But I have looked everywhere on my galaxy 4 and can’t find this option. Any help please? For MMS messages, the sender can request a read report. You should get a warning message for this and let you decide whether you want to provide the info. For text message (sms), I don’t think the default Samsung messages app sends the info. Which app are you using? can you tell me how to turn off the ring from the incoming phone call if I’m in a meeting and the phone is in my purseand I forgotten to turn the phone off? Is there a single button or stroke can push while its on lock screen? Or keep pressing the volume down button. Press power button can also reject the call. You need set it in your call settings. Flip over is a feature to mute ringing? I flip my note 4 but it wont work. Is there a setting to be done? I dont need to set for note 1 & 2. Flip over is so easy. 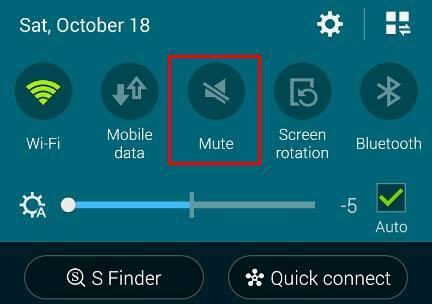 Yes, you can turn over note 4 or use your hands to cover the screen to mute the phone. Settings – motions and gestures – mute / psuse. Is there one button to turn off every sound the Note 4 can make? Even on mute, individual apps make noise. You need set the notification for such apps. Android Lollipop has this feature. So, you have to wait for the update. 2. There is no “Car Mode” on my Note 4. I am a chef so it’s very important that I have an audible timer but being at work, equally important that the phone does not ring. Any simple solution because I’m starting to miss my iPhone something awful? Thanks! Galaxy note 4 has both features. When your galaxy note 4 is in silent mode, your alarm is NOT affected. Alarm also has its own volume control. In the quick settings panel, you can find the car mode. To access quick settings panel, swipe down from the status bar with 2 fingers. Hello, everytime I press the power button, i get a weird beep on my phone and its annoying. It just started less than a week ago. Also when the GPS locator is searching it make the noise too. For the beep when pressing power button, it’s probably the lock screen sound. You can uncheck it at settings- sound- screen lock sound. 2. Settings – application settings – messages – notifications – repeat message alert. Make sure it is off. That is for text messages. You can change setting sin Settings–Application settings—calendar. Change setting sunder Event notification. In the Calendar settings I see 2 options:. 1. Set reminder duration, which I have set at 5 minutes. 2. Set reminder type, wich I have set at “notification panel”, but there’s also an “off” option. The popup is seen in the notification panel and has a small red flag. If I set the “notification panel” to “off””, Will it shut down meeting notifications completely? I do want 1 reminder, at a preset time (say 15 minutes before the meeting). The duration is for snooze. If you hit snooze, it will will remind you again after the length of this duration. You need dismiss it if you don’t want to get the notification for the events anymore. If you set it in Notification panel, it will not disrupt you. but will show an icon in the status bar. If you set it to off, it will not give you any notifications. This will overwrite individual event settings. or 2). you set multiple reminders for the event in S Planner. By default, the remind you 15 min in advance. You can try to add a new one to see the option. Under reminder, if you tap “+”, you can create another reminder. Anyway, you should not set it to off in you need the notification. Is this for a note 4 ? Because I went to settings and messages and unchecked preview and lock screen but it still pops up saying I have a message or missed message . Did you uncheck pop out display? The settings are fire the stock Samsung messages only. If you are using other messaging apps, you need check the settings inside these apps. Settings – application settings – messages – notifications. You can find all sms notification settings there. You can turn off pop up display, you can turn off notification in the lock screen and status bar. Inside Facebook app, you can also turn off sound in the settings. You can use vibrate mode if you need vibration, but not sound. In sound mode, the vibration is due to your settings, e.g., vibrate when ringing. The mute button does not work when I am in a phone call. I can hear the other person, but my voice is muted. Pressing the mute button does not solve the problem. the mute button is to mute your microphone only. It has nothing to do with the speaker or earpiece. If you need adjust volume during a call, use volume button. btw, silent mode is for alerts (ringtone, notification tone). It is very uncommon to pick up a phone then don’t listen to it (you can just use volume down button if you want to lower the volume). Thanks Simon, I will try that and let you know. Thanks again. When I get a notification how do i acknowledge and stop the noise ? You can swipe to left to dismiss the notifications in the notification panel (swipe down from the top of the screen with one finger). Seems to be all apps that appear in the notification bar, in total silent mode when I get a notification my note 4 will give a small vibrate then keep reminding me intermittently with a small viral rate every so offen. 1. Settings – accessibility – vision – notification reminder, make sure it’s off. Even when my Galaxy Note 4 is on silent it still Vibrates when I get a notification, and vibrates at set intervals until I clear the notifications. Which app was sending the notification? Some third party apps may not obey the settings. Which app sends the notification? You can tap and hold the notification, tap app info to find out the app that sends the notification. Third-party apps may have own notification settings.